Auteur theorists beware: Wilco leaves the studio behind in an attempt to just plain rock you. Wilco's last two albums have gotten attention for the technical work that took place inside the studio. Yankee Hotel Foxtrot and A Ghost Is Born, both aided in production by Jim O'Rourke, revealed the former alt-country poster boys' desire to play with their traditional sonic palette. Critics pretended that terms like "deconstruction" and "experimentation" and "sonic palette" still had meaning. The band had become artistes and shed their cult status during the same period. Everyone but Wilco themselves seemed to forget something important about the group: rock bands like to rock. Their live sets throughout the past few years have maintained an intensity and harshness even among frontman Jeff Tweedy's more sparse and plaintive songs. On the new double live album Kicking Television: Live in Chicago, "At Least That's What You Said" most obviously shows the combination of the calm and rowdy. Taken from Ghost, the track starts in the midst of a rocky and violent relationship, depicting a sad conversation and reflection, before melting down into guitar anguish. It's the previous album's finest moment, and it carries beautifully to a live setting. The nastier guitar moments throughout the set are aided by relatively new member Nels Cline. One of the most exciting musicians in rock today (if you want to pin him to just that genre, which you shouldn't), Cline brings a new level of virtuosity to an already-talented group. Of course, without visuals, it can be hard to pick out which guitar lines are him (three musicians, Tweedy, Cline, and Pat Sansone are given guitar credits), but his presence its always palpable (when it doubt, blame him for any overdriven freakouts). The new lead lines on "Handshake Drugs" turn the track from a catchy little folk-rock number into a monster. That number's expanding guitars and bass groove start the finest series of songs to be found on this collection (not an actual set -- the songs were pulled from several nights of shows in Wilco's hometown Chicago). 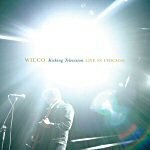 Following it with "I Am Trying to Break Your Heart", "Shot in the Arm", and "At Least", Wilco shows an amazing ability to merge memorable lyrics, powerful music, and captivating performance skills. A few tracks later, disc one closes with "Kicking Television", a song that can be exciting live but won't ever be a classic. Originally tested at live shows (often as an encore) the song made its way onto a bonus EP added to Ghost for a European tour. After a string of strong numbers, its appearance is an unnecessary attempt at rowdiness. It gives its name to the album title, I suppose, only since it's representive of live-ness. Disc two doesn't acheive the sustained heights of its predecessor, but that's no knock against it. The last five tracks especially work especially well, unlikely the laptop-driven drums on "Heavy Metal Drummer", which provide the album's sole noticeable mistake, but Tweedy's sarcastic acknowledgement of their late arrival makes the moment charming, and if you want a clean version, you probably already have your copy of Yankee Hotel Foxtrot handy. That small flub gives way immediately to a piano-driven "Poor Places", a song that's pretty and painful on record, but utterly meaningful in the way that might be mockable in rock, but people who feel that way aren't going to dig Tweedy and his gang anyway. It's lilting lines turn to a heavy pound that turns to noise and arhythmia. The song's refusal to be "going outside" turns into a claustrophobic collapse. In a moment of smart sequencing, "Spiders (Kidsmoke)" comes in with its repetitive guitar-line. The song's tension and scraping doesn't provide a release from the end of "Poor Places", but it re-directs that sensation into a new state of anxiety. A drone-based stretch eventually bursts into one of Wilco's biggest riffs and a gnarled guitar solo. As the penultimate track on Kicking Television, it brings the live experience to a cathartic crescendo. The band closes the disc with a cover of "Comment" by Charles Wright (of "Express Yourself" fame). The song's love-y lyrics and slow time give the disc an unlikely, and not fully satisfying ending, more like an afterword than an encore. Wilco's performance gives the number an ambivalence, but the song functions, as Tweedy says they intend it, just as a good-bye. It aids returning to the world after the chaos of the preceding track. Over the course of nearly two hours, Kicking Television gives a good picture of Wilco live. None of the songs are too radically altered, but each one takes on something -- more dirt, more nakedness, fuller sound -- from its live version. With smart sequencing and good production, the album documents one of rock's most engaging acts in the manner they deserve.